The relic from the days of Tacoma’s dreams as a ‘Hollyood-by-the-Sea’ shows at Northwest Film Forum. The year The Eyes of the Totem, was filmed, back in 1926, Tacoma was thoroughly engaged in the war with Seattle for the title of the Northwest’s greatest city (which some might argue continues today). They made a few notable power plays that year, both of which, however, ultimately flopped. First, they attempted to rename Mount Rainier as Mount Tacoma—a drawn-out campaign that met its end in the House of Representatives. 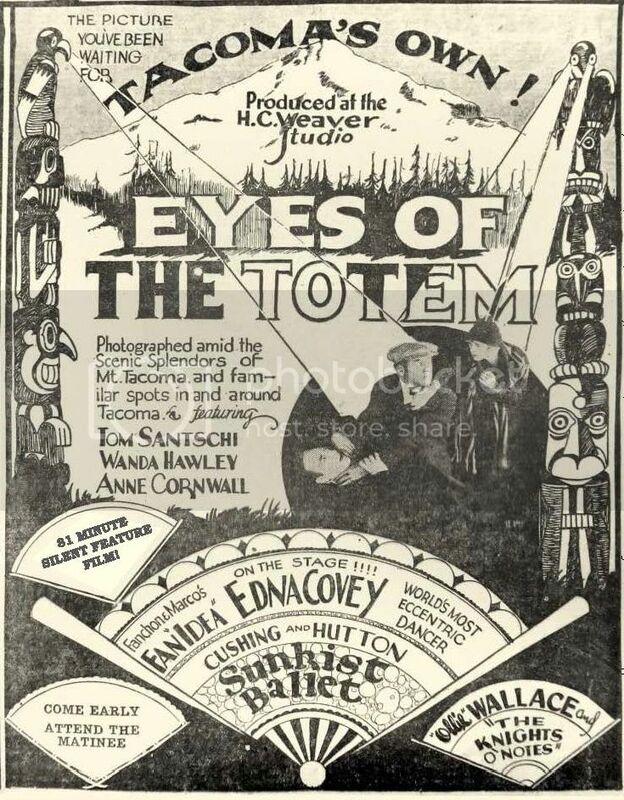 Second, Harvey C. Weaver would get the closest he ever got to turning Tacoma into “Hollywood-by-the-Sea” with the buzzed-about production of Eyes of the Totem. This weekend, the film sees its premiere in the city limits of its lifelong adversary Seattle for the first time at the Northwest Film Forum. An ad for the film from the Tacoma Ledger newspaper, 1927. Eyes of the Totem was the second of what would only be three silent films produced by H.C. Weaver Productions Inc. before Al Jolson’s paradigm-shifting “talkie,” The Jazz Singer, would effectively wipe silent films out for good in late 1927—the same year Eyes and Weaver Productions’ final film Heart of the Yukon saw commercial release. The Tacoma studio would shutter a year later, unable to afford the expensive sound equipment it would take to compete with the new wave of talkies being funded by the major big-budget studios in Hollywood. But right before Jolson and Hollywood dealt the finishing blow, Eyes of the Totem was the film that gave weight, albeit briefly, to Tacoma’s dreams as a future center for cinema. Weaver secured Woodbridge Strong Van Dyke to direct the film, a well-known director with 37 films under his belt, as well as Wanda Hawley, an actress who had her big break in a film by Cecile B. DeMille (credited as “a founding father of the Hollywood Film Industry”) and who just so happened to have grown up in the Tacoma area. The production’s filming caused a big buzz in town. But Eyes of the Totem and the two other Weaver films, which effectively disappeared after their commercial release, turned into something of a local myth as eight decades passed by. Fast forward to 2014 when City of Tacoma historic preservation coordinator Lauren Hoogkamer, who had heard of the mythical Tacoma film, began doing some detective work. Her investigation and research led to a phone call to the Museum of Modern Art (MoMA), one that would end with the ultimate prize: the discovery of the complete film on five reels, tucked away deep in MoMA’s film archives. After a restoration project supported by the Tacoma Historical Society, Northwest history professor Michael Sullivan at UW Tacoma, and the Tacoma Art Museum, the newly-discovered Eyes of the Totem returned home to re-debut in Tacoma last year. The film features shots from historic parts of Tacoma both remaining and long-gone, and takes its name from the iconic totem pole still standing at Fireman’s Park. The plot is a psychological murder-mystery following the wife and daughter of a miner who live in a log cabin in a frigid Northern town. When the family moves down to Tacoma to finally cash in on their mining claim, the husband is murdered and their family savings stolen by a mysterious man with distinctive eyes. The wife wanders the streets a begger with a child to care for, constantly on the lookout for the eyes of the killer. The Northwest Film Forum’s screening will include a discussion with the film’s preservationists as well as the composer of its new score. If you want to brush up a bit more on the film’s history and the story of its preservation so you have some informed questions to ask the panel, Craig Sailor at The News Tribune has an excellent deep dive into just that. Eyes of the Totem, Northwest Film Forum, 1515 12th Ave., nwfilmforum.org. $11. All ages. 4 p.m. Sun., Dec. 18.